Designed and manufactured for a wide variety of medical applications, our medical equipment pressure gauges are in daily use in clinics and hospitals around the globe. U.S. Gauge medical gauges can be found on angioplasty inflation devices, anesthesia equipment, medical regulators, respiratory equipment, dental systems, and many more. 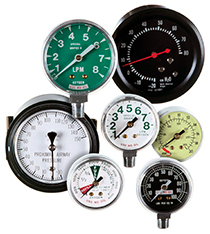 Gauge sizes range from 1” to 2½” so a solution can be found to fit most any equipment or space requirement. U.S. Gauge has over 100 years of experience providing quality gauge pressure solutions for OEM customers, and over 30 years of successful service meeting the rigorous demands of the medical industry. To purchase these models through our webstore, please click here.